Welcome to the best resource for P@L-MATE, Z-Touch and Gadget & Gear Mini PDA users - the smallest PDA with touch screen and wireless download function. Along with various useful functions - phone book, clock & alarm and calculator, Mini PDA provides your personal fortune teller, a schedule reminder preventing you from missing important events and two built-in games. The following will introduce you to all the features Mini PDA offers and give you many hints for its successful use. You see, Mini PDA is more than only a PDA. I don't know if I have an older version, but the pictures on that site did not look like the pda I had. Also, my pda has something about Z-Touch on it, but in the pictures they had P@LMate or something like that. We actually have a multi-language support website. 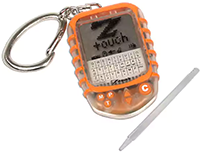 Your Z-Touch is sold only in the US is technical the same item as a Palmate. So, any instruction applies to both versions. I'm using Windows 2000 / NT / ME / XP and see only error messages. What's wrong? Unfortunately, the program runs only under the Win9x family. A revised version for the operation systems you ask for will be ready soon. We highlight this on our website. Do you plan to bring up different languages? We have also manuals in Spanish. On my mini PDA, the top left of the picture is nothing but an empty block. How can I fix that? Press "RESET" + "P" at the same time. The Mini PDA seems to be a nice product, but it apparently lacks a way to SEND notes TO a PC. Is there a way to build or buy a two-way PC interface? Indeed, it's a one-way communication. The cost of a two-way interface seems to be too high. I have recently purchased a z-touch mini-pda and was wondering if it is possible to program your own games or find other games to load into it. Actually we have only the two built-in games, because they are written on the IC. Hi, I'm interested in your mini-pda. How can I get it? How much it costs? If you are in the U.S. you can buy it at Wal-Mart, Target Stores or OldNavy. Contact us and tell us your location that we can find a retailer in your area. How can I download animated pictures from your website? See the menu "Animated picture"
I recently bought a mini-pda and I was trying to get different animations. I downloaded the software, and I followed all the steps afterward, but my pda still reads ID error. Hold the pda so towards the black area, that the "eyes" on the backside are right in the middle of the flashing area. And, don't move the pda while transfer is on. I bought a mini-pda, all my friends love it, but keep asking how much memory does the pda hold. Your mini-pda is able to store 3KB of data for phone book, schedule, animation etc. So, if you take a animation picture, which has 254 Byte you see that it's quite lot of memory. I have problems downloading the program. We putted two versions on our site. One of them is zipped, the second is original size. You download them by clicking on them and agree to all suggestions your computer brings up. I have a white box on my animation screen. Please tell me why its there. This white box appears after transmission failure. It should disappear after pressing RESET + P at the same time. If this doesn't help, make a "cold restart" - remove the batteries for some seconds. But make a data backup first. Do you have a Macintosh version of your software? How do i get the icons on to my pda? See the menu "Animated picture". Every time I try to upload an animation picture it says that the file has to be in bmp format How do I get it into bmp format so i can upload it. Every painting program as MS Paint can save BITMAPs .bmp. Use the Help-function of your program to find out more. I was able to save the ICONS to my computer but, when I transfer them to my PAL MATE, the icon is over the animation that came already stored on it. You can have only one animation screen on Palmate. Please make sure to use only the BACKGROUND Files section to upload a file to your pda, not the ICON file. How do I get the stored animation that was on it when I purchased it my mini-pda? There's only one possible way. Remove batteries for some seconds and insert them back. But attention, your mini-pda forgets all stored information. What's for and what's the difference between the "monitor flash" and "Numlock & Capslock" options. If you use a standard computer monitor, you should select the "Monitor flash" option. For LCD - Display users we added the "Numlock" & "Capslock" function, because an LCD does not have the lighting power. I had sound on my unit but suddenly it muted. How can I turn it ON again? Press "Time "& "Down" at the same time and the sound returns. I was downloading an animation and my Pal Mate is stuck in the transfer mode and will not turn off. What shall I do? Try to press "Reset" on the rear side of the unit. How do I erase an icon? I accidentally put one on when I don't really want one. You can download another animation. To get the initial animation you must remove the batteries for some seconds and put them back again. I am trying to download the wireless communications for my Z-Touch mini-pda from your internet site. I have tired it three times and all's that I get is a file that wants to be opened in wordpad. Where do I put my Z- touch on my monitor. My instructions say to put my z-touch in the black area on my screen but there is no black area on my screen. The black area appears after you finished all entries in schedule, phone book or animation. Don't forget to select entries you wish to transfer. When new entries were selected, the Send to unit button is activated. Press it and the black area shows up. I think you should be able to download new alarm tunes into your pda, for example right now mine plays my heart will go on from titanic, can you get it to play any Nsync, britney spears, or any other popular songs? Good idea. We make a new version with several melodies. I am having trouble bringing up new screensavers on your website to download to my z-touch. When you are in "Icon Galleries" you see their names and the most popular picture as well as the "upload" button. Opens a window with browsing function. Select the file you wish to upload. If you like fill in the form fields. Then confirm. The files are pre-checked by the program on size and format. If everything is all right an OK message appears. Then comes the turn to our webmaster - that's me - who controls the file. Only after he confirms the picture appears in the right gallery. This can some time, because we're sitting in the other corner of the world, okay? Attention: Every picture file, containing any offending material will be deleted immediately. Finally, a picture will be published only once. So, if you see a file and like to update it a second time you waste only your and our time. Hi, I have a mini-pda and the 1st time that I tried to download an internet off the internet, there was an error. I understood what the error was, but the problem is that ever since then, there's a white block in the middle of my animation 9x9 pixels big. I can still download other animations, but that just stays there in the middle. Please see the answer on the "white box" question. On the program that lets you download from your desktop on the schedule reminder it doesn't let you select am or pm. Or does it? May I switch between military time and AM/PM? No, we have two different versions. But the newer ones have all the AM/PM time format. There is no Matchmaker, although you promised it. Matchmaker is a function, where two users can check their compability to each other using the fortune teller. Go to this menu point and read the instruction.